Sunday 25th November saxophone workshop at the Grey Lady. This time we had a rhythm section backing us, first time that the players had done this. Also some improvised solo's. I would like to thank everyone who came. Great food and great company. 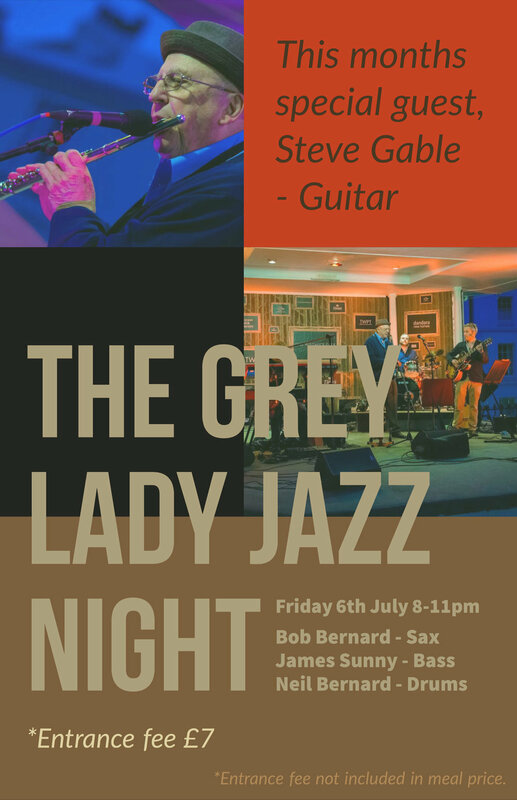 This month we have Steve Gable in the house on guitar - Join us at 8pm! Bob is excited to announce the launch of a number of Saxophone and Clarinet workshops with Bright Young Things at their Tunbridge Wells Centre in Camden Road. Starting with a Saxophone Workshop – Sunday 15th February. Details available at Bright Young Things. Open to school pupils aged 8-17 and adults 17-80yrs. You do not need to have passed an exam; however, grade 3 standard is recommended. Your chance to play with trios, quartets and large ensembles, playing a variety of music (Jazz, Swing and Classical), with lots of scope to stretch your playing, make friends and have fun. There is nothing more rewarding than playing with other musicians. If any individual has an exam coming up, please let us know so that we can put you in the right ensemble. Bob and Iain Rae playing a cheeky funky blues at Sopranos Tunbridge Wells. The Bob Bernard Trio went down great at the Tunbridge Wells Jazz Club in May 2014 and we've been penciled in for next year ... watch this space. Heres a video shot at the successful event!